The Freeman/Lozier Library is always changing to keep up with the latest trends and services to offer you our best. 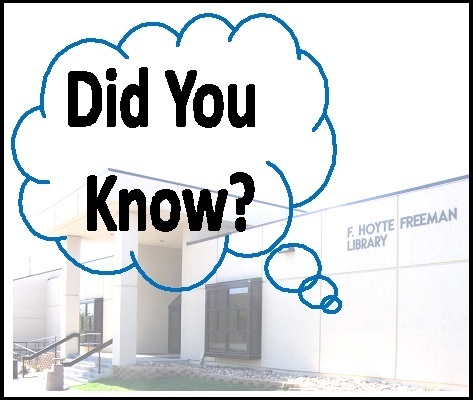 Our More Than Books newsletter has a “Did You Know” section that keeps you informed about the changes that have taken place in the library. The Library has monthly circulation/reference counter displays? The Library sets up monthly circulation/reference counter displays to market and showcase library events, workshops, collections, and contests. The Library has a new charging station? The new charging station arrived and is ready for you to use. It has the new Bellevue University logo and has updated ports to plug in your devices. Library is offering Skype Reference sessions? Cannot come to campus? Sign up for a face-to-face meeting with a librarian. Here is the link to sign up: http://bit.ly/SkypeReference. Originally posted in the Freeman/Lozier Library’s quarterly newsletter, More Than Books, V. 19 No. 4, Fall 2016.